Our company engaged in Supplying and Manufacturing of Portable Office Cabins used for Housing Offices thereby Offering Instant Cabin Solutions for Running Offices on Sites by having all the Comforts which are normally available in a Regular Office. Office Cabins are Portable and can be transported from one Site to another Site within Minimum time, thereby, Saving time and Money while executing Major Projects. The Frame of the Cabin is fabricated using MS Sections and the Outer Surface of the Cabin is welded with 1.2 mm thick Profile bent GI sheet and Painted with Epoxy Coating to withstand Severe Weather Site Conditions. The Cabin Interior Walls are fitted with 8 mm thick Laminated Sheet. These Cabins are fitted with Metal Doors and Glazed Metal Windows with Sliding Shutters which can be locked and are fitted with Mild Steel Grill which is Totally Welded to the Frame thereby Assuring Safety. These Cabins are provided with Working Tables and Chairs. 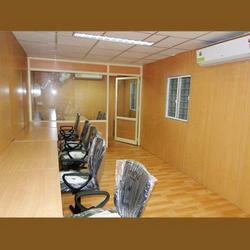 Partitions can also be provided for Managers. Further, as per the requirement of the Customers, AC units can also be fitted. We are leading Exporter and Manufacturers of Office Cabins which includes Portable Office Cabin, Containerized Office Cabins, Modular Office Cabins thereby Offering Instant Cabin Solutions for Running Offices on Sites by having all the Comforts which are normally available in a Regular Office. Portable Cabins can be transported from one Site to another Site within Minimum time, thereby, saving time and Money while executing Major Projects. The Frame of the Cabin is fabricated using MS Sections and the Outer Surface of the Cabin is welded with thick Profile bent GI sheet and Painted with Epoxy Coating to withstand Severe Weather Site Conditions. The Cabin Interior Walls are fitted with thick Laminated Sheet. These Cabins are fitted with Metal Doors and Glazed Metal Windows with Sliding Shutters which can be locked and are fitted with Mild Steel Grill which is Totally Welded to the Frame thereby Assuring Safety. These Cabins can also be provided with Working Tables, Chairs and Partitions. Looking for Portable Office ?